When Stevie Wonder wrote his hit single “Signed, Sealed, Delivered I’m Yours” in 1970, he likely never imagined the words would form the theme of a national Catholic gathering for youths. Signed—by the waters of baptism. The rain that fell outside Lucas Oil Stadium in Indianapolis on Nov. 21 proved appropriate, with the opening general session focusing on baptism. Xander Eisert of the Archdiocese of Louisville, Ky., 15, described the scene. Xander was not the only one impacted by the procession. “It was impressive to see that many priests in one area,” said Luke Grant, 17, of the Diocese of Lansing, Mich.
“I hope to spend some time in adoration while I’m here. On the bus ride here, our guide talked about how there is a thin veil between God and man, and how in the Eucharist that veil is literally taken away, and you’re in the presence of God. That’s pretty cool,” said Luke. 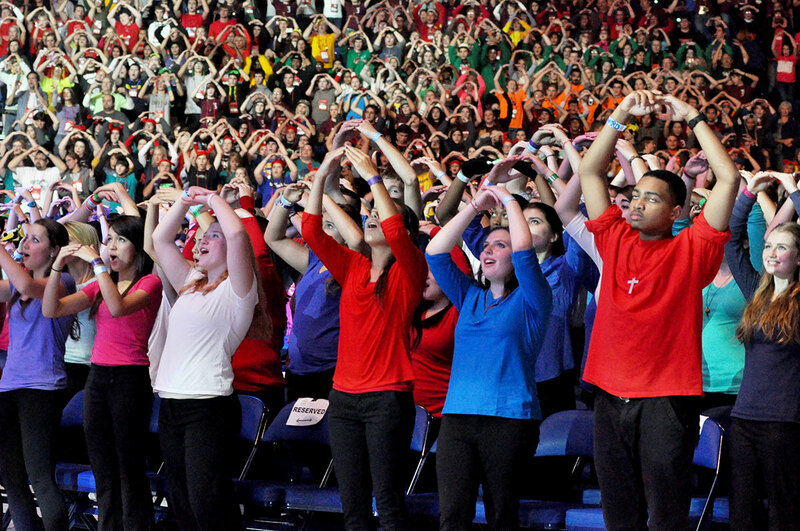 From the quiet of the adoration chapel in the convention center, the youths made their way to Lucas Oil Stadium for the music performances before the opening general session. In the stadium, the teens swayed, clapped and even formed a conga line to inspiring songs by Grammy-award winning musician Israel Houghton, the energetic tunes of Grupo Huellas and the rap sounds of Righteous B. Overhead, Twitter messages from participants flashed on several Jumbotron screens, statements of joy, excitement and anticipation from youths across the nation yet all under one roof in Indianapolis. The opening general session began with Catholic catechist, singer, musician and Two by Two Ministries co-founder Jesse Manibusan taking the stage as emcee for NCYC. Manibusan introduced Catholic singer and songwriter Matt Maher. Thousands of teens rushed the stage as he opened with several of his popular songs. On the Jumbotron screens flashed a picture of a young boy. “That’s my 2-year-old son, Conner,” Maher said. “Baptism is about being found—by God,” Maher continued. “It sets you up for a life of fulfillment, a life of purpose, a life of meaning. “The problem is, sometimes we make a mess of it. We’re covered in sin. “Your expectation is that God has condemnation or shame for you. But he doesn’t. “This weekend, God wants to empower you, to help you realize how precious you are in his sight,” Maher concluded. Bishop Christopher J. Coyne, vicar general, offered closing remarks about the sign of a baptized disciple. “There’s going to be troubles in our lives, times when things don’t go right,” the bishop said. “But I really think what marks us most as disciples is the joy of knowing that we’re signed, sealed and delivered, of knowing from whom we come and to whom we go. Sleep seemed far from the minds of the energized teens. For Mason Fisher of the Diocese of Columbus, Ohio, a first-time NCYC participant, the scene left an indelible mark on his mind. “It is so powerful seeing all these people come together,” he said. 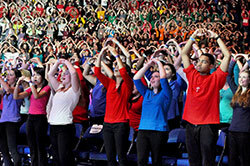 Maya Johnson of St. Mark Parish in Indianapolis, also new to NCYC, agreed.